In a joint operation, the Special Cell and the North district police claim to have arrested seven kidnappers, including a former Assistant Commissioner of Sales Tax, who had kidnapped a businessman’s son and his driver on February 25, and demanded a ransom of Rs 1crore for their safe release. Seven members of a family in the district have been booked by the police in connection with the death of a married woman on Saturday. The Pilkhua police last night shot dead a criminal carrying Rs 2,500 award on his head, while his two companions gave the slip to the police. A case for land scam worth Rs 600 crore has been filed in Kasna police station here, naming 89 persons, including master swindler Moti Goel, his family and near relatives. The case pertains to getting over 100 hectare land transferred to his name on the basis of fake registries. The new industrial complex on the Delhi-Haryana border is springing to life with nearly 1,000 factories under various stages of construction. A clear understanding of the label and dosage information is necessary while medicating children. A well-highlighted label explaining dosage instruction in simple tabular forms and precautions in simple English would achieve the purpose of complete treatment, compliance and appropriate medication. The residents of Subhash Nagar, falling in old Gurgaon city, are a harried lot as the place has become a haunt for drug addicts and other anti-social elements. A youth is reported to have mercilessly severed the head of his guru with a sharp-edged weapon in the holy city of Brij Ghat under Kotwali area. In a letter to the Chief Minister, Mrs Sheila Dikshit, the Leader of Opposition in the Delhi Legislative Assembly, Prof Jagdish Mukhi, has demanded that the government should not force the light commercial vehicle owner to have CNG kits fitted in their vehicles. The staff of the New Delhi Municipal Council today staged a demonstration to demand a commission be set up to investigate what they called widespread maladministration and graft in the civic body. The Delhi Police has been allotted a budget of Rs 1249.64 crore for the year 2005-2006 by the Union Finance Minister, Mr P. Chidambaram, for the modernisation of the police force. Dr Mahesh Verma, Principal, Maulana Azad Dental College and Hospital, Maulana Azad Medical College, has been awarded gold medal by the FMS, University of Delhi, while pursuing his Masters in Business Administration in Health Care Administration. The sleuths have also recovered Rs 20 lakh ransom money, two country-made weapons along with live cartridges, three knives, nine mobile phones tranquilizers and a Maruti Esteem car from their possession. The accused have been identified as Ashok Kumar Mishra (62), Upender Choudhary (32), both residents of Ghaziabad, Sunil Bhatti (30), resident of Dadri, Gajender Singh (46), resident of Ghaziabad, Satish (32), resident of Meerut, Gokaran (32), resident of Nepal, and Jaideep (28), resident of Kerala. Joint Commissioner of Police (Special Cell) Karnal Singh said that the Civil Lines police received a complaint from the victim’s father that his son and his driver had gone to meet some business contacts in a Lancer car, but never returned. After some time, a call was received from his son stating that he and his driver were kidnapped and he should arrange Rs one crore. Based on the complaint and directions from the Delhi Police Commissioner that Special Cell should assist in the investigation, the police started investigations to ascertain the whereabouts of the duo. It was during this time, the kidnappers after negotiations came down to Rs 20 lakh and also fixed a petrol pump near Ghaziabad as the place to deliver the ransom money. However, the kidnappers, after collecting the money, told the businessman that his son would be released in five hours time. In the meantime, the Special Cell sleuth found out by technical investigations that the victims were in Sector-37, Noida. Accordingly, the sleuths laid a trap and nabbed the accused. During interrogation, the kingpin Ashok Kumar Mishra, a former employee of the Sales Tax department told the sleuths that he formed a gang to extort money from businessmen. He also said the gang was earlier involved in two cases of kidnapping and a case of extortion. Singh said that the gang had knowledge about the businessmen dealing with electrical and steel industries and used to allure them to their rented accommodation in Noida. Once the victims reach the place for business talks, the accused used to keep them in captive till the ransom money was paid. With the arrest of two persons, the New Delhi district police claims to have busted a gang of cheats involved in at least three cases of fraud. 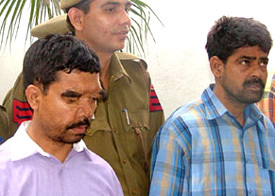 The accused have been identified as Mohammad Hussain Ali, alias Rai Babu and Naushad, alias Suraj. Acting on a complaint from one Satyanarain Aggarwal from Jaipur that in December 2004, one person posing himself as a businessman from Kolkata, met him and offered him to provide high quality elaichi and clove at low prices through his customs officer-friend. He also provided the high quality sample to Aggarwal and after finding the quality to be extremely good, Aggarwal agreed for further talks. It is alleged that the victim was ‘murdered’ after she had failed to fulfil the dowry demands of her in-laws. No arrest has been made so far. According to the complaint lodged by one Vijaypal, a resident of Mitrol village in the district, his sister Basanti, 22, had been murdered allegedly by her in-laws, including her husband for dowry. The woman had been married about a year ago and living with her in-laws at Bhahbalpur village. As per the complaint, the woman was first strangulated and then her in-laws tried to dispose of her body without informing her parents. The police have registered a case under Sections 304-B, 201 and 34 of the IPC against the accused identified as Naresh, Khemchand, Suresh, Nawal, Shanti, Anita and Rajwati. It is alleged that the accused had demanded Rs 50,000 and a mobike and the victim had been even turned out of her in-laws’ house a couple of times after the marriage. In another case, the police are yet to arrest the accused involved in the scam related to the stealing of about Rs 4.35 lakh from an ATM counter of the local branch of the State Bank of Bikaner and Jaipur in the NIT area here. While the money was stolen on February 12, the police have not been able to make any breakthrough in the case. This is first such case in the town and the district, and it is suspected that it could be connected with a couple of similar incidents reported at Ambala and Ludhiana earlier. A case had been booked against some unknown persons on the complaint of the bank officials here. The police had recovered a.315 bore revolver and cartridges from the encounter site. The deceased has been identified as Raju of C. Raj Patt, Pilkhua. He was wanted in eight cases of murder, loot and murderous assaults. The dreaded criminal was also wanted in a woman’s murder in Pilkhua village four months ago, S.P. (Rural) B.K. Shekhar said. Giving the details of the encounter, Mr Shekhar said Inspector Vishesh Kumar Singh, S.O. of Pilkhua police station, was patrolling with his colleague last night when he saw three criminals moving in suspicious circumstances near a petrol pump in Chhyarsi. Seeing the police jeep, the criminals opened fire. In the retaliatory fire, one of the criminals was wounded while two escaped. The wounded criminal was rushed to government MMG Hospital, Ghaziabad, where the doctors declared him brought dead. The deceased was a dreaded criminal carrying Rs 2,500 award on his head and was wanted in 8 to 10 cases of murder, loot etc., including the murder of Mrs Rajesh Devi in a Pilkhua village. The maternal uncle of a young girl has killed her by tightening a noose around her neck in Laxmi Nagar Colony in Modi Nagar. The girl had married a neighbour without the approval of her uncle. Though the mother of the deceased has lodged a written report in the police station, police are understood to have registered it as a suicide case. Shanti (name changed) and her neighbour had married in a court eight months ago. After learning about their clandestine marriage, her parents fixed her marriage in Meerut. However, the girl opposed this new match and fled her house. Somehow her parents were able to bring the lovers back. Later a panchayat meeting was summoned. The panchayat ruled that since the marriage of the lovers was an accomplished fact and cannot be undone now, the couple should be allowed to live together. A case for land scam worth Rs 600 crore has been filed in Kasna police station here, naming 89 persons, including master swindler Moti Goel, his family and near relatives. The case pertains to getting over 100 hectare land transferred to his name on the basis of fake registries. The government records and revenue documents were tampered in the process. According to Addl. District Magistrate Rajesh Kumar Singh, Moti Goel of Nav Yug Market, Ghaziabad, had got 100 hectare land transferred in the names of his mother Premwatti, sister-in-law, Suman, and sister Mamta, besides his own name by tampering with the records and documents. Some revenue officials had also connived with Moti Goel. Addl. DM Rajesh Kumar Singh said 100 hectare land is over 400 bigha which is worth about Rs 600 crore in the market. Moti Goel had applied for the transfer of land 10 years ago when this village was in Bulandshahr district. But his claim had been dismissed by the then SDM, terming the claim as false, but strangely, the then District Magistrate Bulandshahr has issued the registry deeds in 1997. ADM Singh said on April 4, 2001, the Court of Addl. Commissioner, Meerut, had cancelled the title deeds terming them fake. Later, an inquiry was held which concluded that all these documents were illegal. On the basis of this, the Kasna revenue officials booked 89 persons, including, Moti Goel, his brother Rakesh, mother Premwatti, sister-in-law Suman, and sister Mamta under IPC 120b, 420, 466, 467, 468, 492, etc. Addl. District Magistrate AK Singh said that Moti Goel adopted different tactics to usurp public land. By conniving with the officials, he got the land transferred to him and his relatives. Subsequently, he also filed a case and claimed his rights on the land in question. While the case was on, he ensured that no government official visited the site and ultimately the land was transferred to his name. The sprawling industrial complex in Bawana in North-West Delhi, being developed by the Delhi State Industrial Development Corporation (DSIDC) to shift polluting industries away from the city, has already allotted land to 8,215 entrepreneurs, DSIDC Managing Director Jalaj Shrivastava said. The corporation handed over allotment papers to another 700 during a five-day camp of the Relocation Scheme of Industries, which concluded on Saturday. The DSIDC Executive Director, Ms Rita Kumar, who led the camp, said a little over 700 allottees were handed over possession papers of their respective plots. The corporation has developed 16,257 plots of sizes varying from 100 square metres to 250 square meters spread over five sectors. Mr Shrivastava said the corporation has acquired an additional area measuring 450 acres in Sanoth, Rajapur Kalan and Bhorgarh villages in North-West Delhi. The work for project consultancy has already been awarded, he said. ‘’The relocation of industries is one of the key achievements of the corporation,’’ said Mr Srivastava. In its bid to provide low-cost houses to industrial workers, the DSIDC is constructing 3,164 units, which are aesthetically designed, he added. Health India, an NGO that inquires and surveys health-related concepts, undertook the issue of consumer-friendly product labeling as they appear on the packs of medications of ten prominent manufactures. Analysis using comparative data on common parameters of labeling was then performed. This study examined the profile, content and complexity of language on labels from a patient’s perspective with the resolve that a patient might forget or overlook their doctor’s instructions on drug awareness. However, result of study showed varied emphasis on labeling by most pharmaceutical companies. For example, Nimesulide oral suspension or Nimegesie has a tabular form of dose instructions with no comparison of dose, weight and age relations. This can be confusing to a doctor leave alone an ailing patient. Similarly, the oral suspension of Ibuprofen or Ibugesic utilizes complex medical terminology such as bronchospasm, rhinitis and urticaria that would mean little to a common user. Commenting on the importance of label, Dr P. K. Singhal, Senior Consultant (Paediatrics), Indraprastha Apollo Hospital, said, “Labels are very useful for doctors as well as for patients, as it gives clear cut information on the formulation, medicine’s basic content and its preservation. The label helps consumers about the usage of medicine like shaking the bottle before use and describes its use depending upon the age factors of patients. It specially helps in this busy scenario when doctors are not able to explain the various information of the prescribed medicine or checking purchased medicine because of paucity of time”. “Not at large but a few pharma companies are providing consumer-friendly label, which deliberate the patients about the medicine’s use. This practice should be adopted by all pharma manufacturers and drug controller/monitor should scrutinize this issue before giving license,” he added. The residents point out that if the issue is not attended to immediately, the locality will soon become a haven of deviant culture. About 100 residents of the area have submitted a joint memorandum to the district police chief, seeking urgent action in the matter. The police say that it will look into the issue. The residents allege that a telephone booth, run by a bank staffer, has become a den of the anti-social group. After the gory act, the man went around the town, holding the head of the slain guru for quite sometime. This created a panic in the city. Later, the police arrested the killer. According to police, Bilu Sharma of village Palwara, ran a tea shop near Avdhoot Asharam on Shamshan Ghat Road in Brij Ghat City. His 60-year-old father Ramesh Chand performed prayers and meditative programmes in the Ashram. One Narinder Chauhan of the same village used to work at the shop. He became Ramesh Chand’s disciple for learning ‘karam kand’ (practical life) and other meditative techniques. However, Chauhan got fed up after about two years and developed hatred for his guru. Soon he left him and went back home. He came back on Sunday quite unexpectedly and attacked Ramesh Chand while he was praying in the Ashram at about noon. He severed Chand’s head and then started walking around the town, holding his head like a man possessed. This spread a great panic in the town. The police arrested him and seized the blood-stained weapon. He said that the owners of light commercial vehicle would be severely hit by this decision, as their utility would be limited to the national Capital. Prof Mukhi stated that this decision by the government would force the light commercial vehicle owners to get their vehicles registered with the neighbouring states. Hence, he has asked the government not to force the commercial vehicle owners to fit their vehicles with CNG kits. The staff of the New Delhi Municipal Council (NDMC) today staged a demonstration to demand a commission be set up to investigate what they called widespread maladministration and graft in the civic body. During their demonstration at Jantar Mantar here, the NDMC Employees Union also sought cancellation of power supply licence to private utilities. The leader of the Union, Mr Shailendra Gautam, also called for immediate debt recovery, saying several politicians and industrialists owed huge amounts to the NDMC. 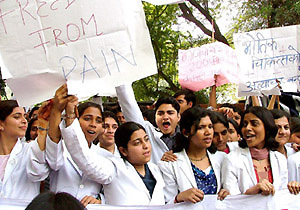 The protesters submitted a memorandum to the Lok Sabha Speaker, Mr Somnath Chatterjee, over their demands. They said the council should set up a panel to fill 4,000 vacancies in the body. The Delhi Police was allotted Rs 1134.20 crore during the year 2004-05 and there has been an increase of Rs 115 crore this year, which is significant in terms of development of the force. The main focus has been given to traffic management, VIP security, licensing, construction of residential accommodation and police buildings, housing and registration of foreigners. Earlier, the expenditure of the Delhi Police was met by the Government of National Capital Territory and Delhi. The Central Government is now looking after its budget with effect from August 1, 1996. Dr Mahesh Verma, Principal, Maulana Azad Dental College and Hospital, Maulana Azad Medical College (MAMC), has been awarded gold medal by the FMS, University of Delhi, while pursuing his Masters in Business Administration (MBA) in Health Care Administration. The FMS has been running three-year MBA programme for medical professionals to improve their management skills.